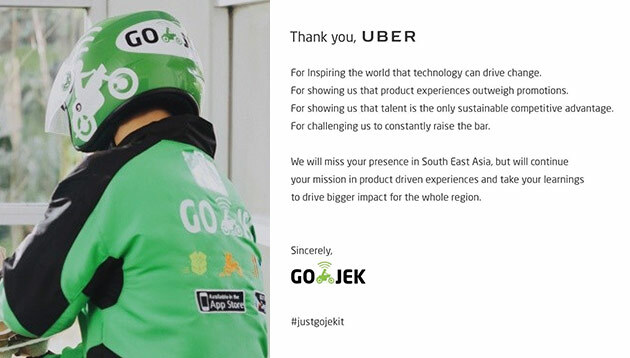 Indonesia-based ride hailing company Go-Jek has written a letter to Uber, published on its social media pages, after it bowed out of Southeast Asia. The move comes days after Uber revealed that it will be handing its Southeast Asia operations to Grab. Netizens’ reactions to the note so far have been mixed, with some praising the company for the PR move, while others seized the opportunity to take aim at not only Go-Jek, but also Uber’s and Grab’s services. The stunt also drew the attention of Ryan Graves, former CEO at Uber. Earlier this week Grab announced it is taking over Uber’s operations and assets in Singapore, Malaysia, Indonesia, the Philippines, Thailand, Myanmar, Cambodia and Vietnam. As part of the move, Uber will take a 27.5% stake in Grab and Uber’s CEO Dara Khosrowshahi will join Grab’s board. Days after the news was revealed, news of Go-Jek’s impending first expansion to another Southeast Asia country in the coming weeks also broke. In an internal memo seen by Reuters, expansion to three other Southeast Asian countries by the middle of this year is also in the pipeline. The company has been ramping up its funding initiatives recently, securing US$150 million from general trading company Astra International in February. This was in a bid to combine its automotive expertise with Go-Jek’s reach with consumers. Google also confirmed its investment in Go-Jek, as part of the company’s initiatives to support and participate in Indonesia’s growth. Other tipped investors also include Singapore’s Temasek Holdings and Meituan-Dianping. Marketing to children or toddlers (read marketing to parents) is a lucrative business. Over the years, more and more brands have s..